In The Likeness, by Tana French, we meet up with Cassie Maddox again, this time without her former police partner Rob Ryan by her side. The body of a murder victim has been discovered in the ruins of an old cottage in a village outside Dublin. Not only is the woman Cassie’s virtual twin but the police discover the victim has been going by the name of Lexie Madison, an identity which the police had created for its drug squad years ago, and an identity which Cassie had used during her stint as an undercover officer. With some trepidation, Cassie agrees to assume this old identity again, and go undercover as Lexie Madison. As Lexie, Cassie steps into the world of a Trinity College graduate student rooming with four other students in an old house close by the cottage in which the victim’s body was discovered. I had enjoyed Tana French’s first novel, In the Woods, despite not liking the ending very much, so I’d been looking forward to The Likeness. But when I finally got a hold of a copy from my local library, I found it difficult to get into the book. I kept reading a bit, and then putting it down and not coming back to it for days. I ended up having to renew the book for the maximum number of renewals, and the main reason I finished it was because, going into the last third of the book, I’d run out of renewals and knew that if I didn’t finish it then, I probably wouldn’t be likely to finish it anytime in the near future. Tana French writes beautifully and eloquently – her writing was one of the things I really enjoyed about In The Woods. But when I finally put down The Likeness for the last time, I found I hadn’t liked it nearly as much as I’d enjoyed In The Woods. I finally realized why the other day, and, as it turns out, it has everything to do with me, the reader, and nothing to do with the book itself. You see, I’d picked up The Likeness anticipating a mystery, but the mystery itself isn’t really the draw of the book. The book’s appeal lies in French’s writing, and in her depictions of the many flawed characters who populate The Likeness. So what happened was this: I expected a mystery, and I kept expecting a mystery. The mystery itself is, of course, an important part of the book, as without it, Cassie wouldn’t be living the tense life of an undercover police officer, surrounded by murder suspects. But I’m not so certain that the mystery itself was the point of the book. I also tend to favor more of a clear line between good and evil in the mysteries I read, so that, at some point during the narrative, there is a specific intent to cause serious harm to someone else. The murderer in In The Woods, for example, is a chilling adversary. This isn’t something that happens, however, in The Likeness. At some point during my reading of the book, I probably should have shifted my expectations – but for some reason, I didn’t. And so I didn’t find it a very satisfying read. I should have read The Likeness as a work of general fiction that uses a mystery as a device to bring readers deep into the lives of the four unusual people who are Lexie Madison’s roommates. I think it would have worked out to be a far better read for me if I’d approached it with these expectations. So there you go. The Likeness is a well-written book featuring a cast of flawed and compelling characters. But I went into it with the wrong expectations – the mystery in The Likeness isn’t the sharp, suspenseful mystery (or mysteries, some would say) that drove the plot in In The Woods. So I wasn’t nearly as enthralled with it as I was with In The Woods, even considering that book’s somewhat unsatisfactory ending. If you go into this book with the right expectations, though, I suspect you’ll enjoy it more than I did. 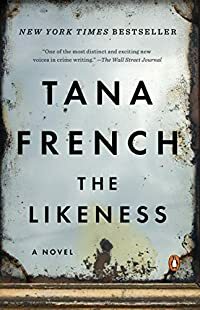 This entry was posted in Books and Reading, Reviews and tagged mysteries, Tana French on November 17, 2009 by Belle Wong.